When Rand created the character of Wesley Mouch, it's as though she was anticipating Barney Frank (D., Mass). Mouch is the economic czar in "Atlas Shrugged" whose every move weakens the economy, which in turn gives him the excuse to demand broader powers. Mr. Frank steered Fannie Mae and Freddie Mac to disaster with mandates for more lending to low-income borrowers. After Fannie and Freddie collapsed under the weight of their subprime mortgage books, Mr. Frank proclaimed last year: "The way to cure that is to give us more authority." Mouch couldn't have said it better himself. But it's a misreading of "Atlas" to claim that it is simply an antigovernment tract or an uncritical celebration of big business. In fact, the real villain of "Atlas" is a big businessman, railroad CEO James Taggart, whose crony capitalism does more to bring down the economy than all of Mouch's regulations. With Taggart, Rand was anticipating figures like Angelo Mozilo, the CEO of Countrywide Financial, the subprime lender that proved to be a toxic mortgage factory. Like Taggart, Mr. Mozilo engineered government subsidies for his company in the name of noble-sounding virtues like home ownership for all. Still, most of the heroes of "Atlas" are big businessmen who are unfairly persecuted by government. The struggle of Rand's fictional steel magnate Henry Rearden against confiscatory regulation is a perfect anticipation of the antitrust travails of Microsoft CEO Bill Gates. In both cases, the government's depredations were inspired by behind-the-scenes maneuverings of business rivals. And now Microsoft is maneuvering against Google with an antitrust complaint in the European Union. Today, Rand is celebrated among conservatives: Rep. Paul Ryan (R., Wis.) insists that all his staffers read "Atlas Shrugged." It wasn't always this way. During Rand's lifetime—she died in 1982—she was loathed by the mainstream conservative movement. Rand was a devout atheist, which set her against the movement's Christian bent. She got off on the wrong foot with the movement's founder, William F. Buckley Jr., when she introduced herself to him in her thick Russian accent, saying "You are too intelligent to believe in God!" The subsequent review of "Atlas Shrugged" by Whittaker Chambers in Buckley's "National Review" was nothing short of a smear, and it set the tone for her relationship with the movement ever since—at least until now. Rand rankled conservatives by living her life as an exemplary feminist, even as she denied it by calling herself a "male chauvinist." She was the breadwinner throughout her lifelong marriage. The most sharply drawn hero in "Atlas" is the extraordinarily capable female railroad executive Dagny Taggart, who is set in contrast with her boss, her incompetent brother James. She's the woman who deserves the man's job but doesn't have it; he's the man who has the job but doesn't deserve it. Rand was strongly pro-choice, speaking out for abortion rights even before Roe v. Wade. In late middle age, she became enamored of a much younger man and made up her mind to have an affair with him, having duly informed her husband and the younger man's wife in advance. Conservatives don't do things like that—or at least they say they don't. These weren't the only times Rand took positions that didn't ingratiate her to the right. She was an early opponent of the Vietnam war, once saying, "I am against the war in Vietnam and have been for years. . . . In my view we should fight fascism and communism when they come to this country." During the '60s she declared, "I am an enemy of racism," and advised opponents of school busing, "If you object to sending your children to school with black children, you'll lose for sure because right is on the other side." If anything, Rand's life ought to ingratiate her to the left. An immigrant woman, she arrived alone and penniless in the United States in 1925. Had she shown up today with the same tale, liberals would give her a driver's license and register her to vote. But Rand was always impossible to pin down politically. She loathed Dwight Eisenhower, whom she believed lacked conviction. And in 1975 she wrote, "I urge you, as emphatically as I can, not to support the candidacy of Ronald Reagan," primarily on the grounds that he didn't support pure laissez-faire capitalism. But she endorsed Richard Nixon in 1968 because he supported abolition of the military draft. Rand was especially proud of her protégé Alan Greenspan for serving with Milton Friedman on Nixon's Gates Commission, the findings of which led to today's all-volunteer army. Rand was not a conservative or a liberal: She was an individualist. "Atlas Shrugged" is, at its heart, a plea for the most fundamental American ideal—the inalienable rights of the individual. 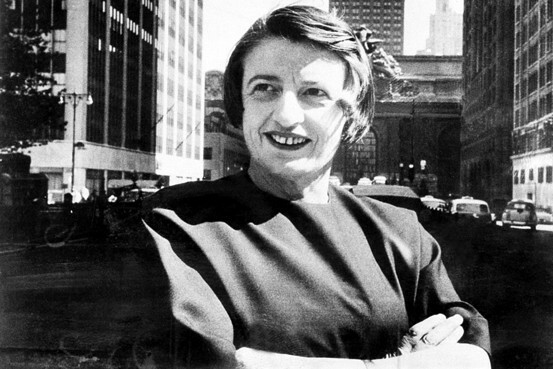 On tax day, with our tax dollars going to big government and subsidies for big business, let's remember it's the celebration of individualism that has kept "Atlas Shrugged" among the best-selling novels of all time. Mr. Luskin is chief investment officer at Trend Macrolytics LLC and the co-author with Andrew Greta of "I Am John Galt," out next month by Wiley & Sons.